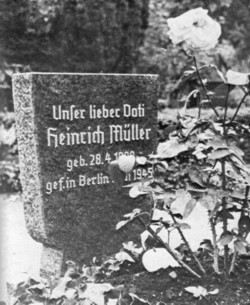 Purported grave of Heinrich Mueller in Berlin. The headstone reads "Our Dear Daddy," Mueller's name, and his dates from birth to alleged death in 1945. When exhumed by court order in 1963, the grave held three skeletons, none with Mueller's short stature and high forehead.